Despite Frequently Changing Weather Conditions, Lexus RC F Race-Cars Control a Topsy-Turvy Race to Score a One-Two Finish! Yuji Tachikawa and Kohei Hirate, who qualified in 11th place, clinch their first victory of the season with a runaway win. Tachikawa becomes sole holder of record for most GT wins. July 23, 2014 - On July 19-20, Sportsland SUGO in Miyagi Prefecture hosted the fourth round of this year’s SUPER GT. 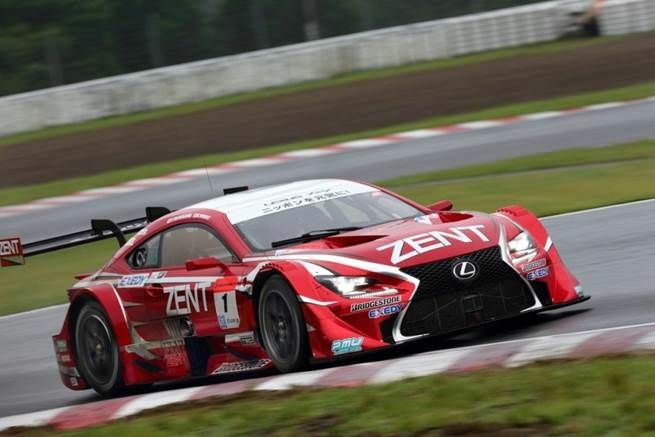 The No.1 ZENT CERUMO RC F, driven by Yuji Tachikawa and Kohei Hirate, started in 11th position but comfortably outpaced the field for its first victory of the season. 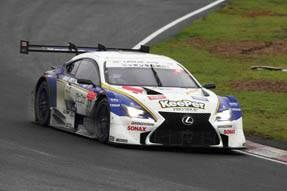 Daisuke Ito and Andrea Caldarelli, in the No.37 KeePer TOM’s RC F, placed second, ensuring that LEXUS RC F scored its first one-two finish since the opening race of the season. The race took place in highly variable weather conditions, and there were frequent changes of position. However, fourth, fifth, and sixth positions were also won by LEXUS RC F race cars, meaning that LEXUS RC F captured five of the top six places. Yuji Tachikawa and Kohei Hirate (center) clinched their first win of the season. Daisuke Ito and Andrea Caldarelli (left) came in second. No.1 ZENT CERUMO RC F took the lead early in the race, and outpaced the field thereafter for its first victory of the season. No.37 KeePer TOM'S RC F placed second, and now leads the team rankings.